After years of planning and legislative action, The Fillmore now sports a vertical marquee sign. The new addition to the building was recently installed by Oakland-based Golden Gate Sign. 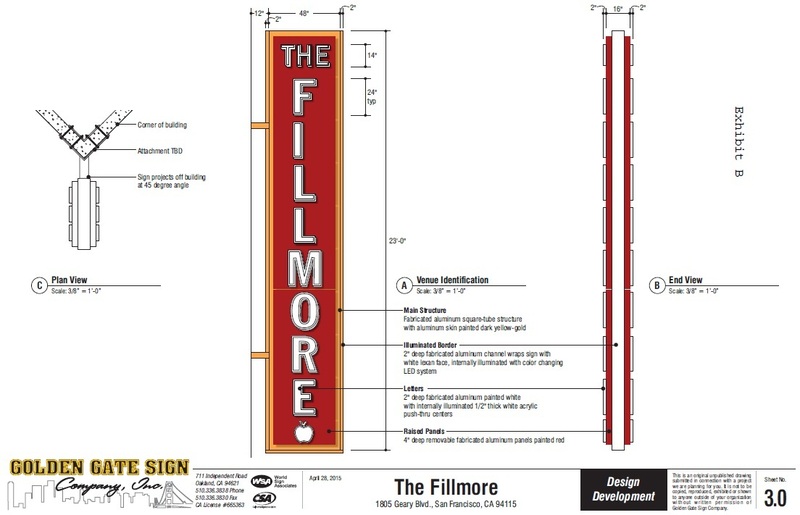 "Five years ago we started the design and permit process for The Fillmore sign," Golden Gate Sign posted on Facebook. "It’s great to see it finally fabricated and installed," the company said, adding that it was a challenging project but its team got the job done. In 2016, the Examiner reported that local regulations prohibited the installation of signs "in excess of 24 square feet and no higher than 24 feet." Before the sign could go up, both the Planning Commission and Board of Supervisors were required to approve an amendment to the law, which would allow for signs of up to 125 square feet and up to 60 feet in height, depending on the size of the building, in the area. City documents show that an application for a corner-mounted, internally illuminated, non-flashing blade sign for a cost of $10,000 was approved two years ago. And original drawings mentioned that the sign projects off the building at a 45-degree angle. The sign reads "The Fillmore" and also displays an image of an apple at the bottom. According to the Examiner, the apple refers to the tub of apples the venue’s concert promoter Bill Graham offered concert goers in the last century as part of his effort to make them feel welcomed. The historic music venue, built in 1912, has been a dance hall operating under various names and managements. It was a roller rink through the 1940s, became the Fillmore Auditorium in 1954 and served as The Elite Club in the '80s. In recent history, No Doubt, Radiohead, The Cure, Sonic Youth, Prince, The White Stripes, Dave Chappelle and Tom Jones have all played there as well. We reached out to The Fillmore for additional comment on its new marquee but have not heard back. Thank you to John C. for the tip. If you've seen something new in the neighborhood, text your tips and photos to (415) 200-3233, or email tips@hoodline.com. If we use your info in a story, we'll give you credit.